Halsey has already proved that she knows how to write a damn good album. That’s apparent with her first studio album Badlands. The 22-year- old clearly has ideas of grandeur when it comes to her music, especially in the sense of what she wants it to do and the story she wants it to tell. With that in mind, it’s no wonder she was able to avoid the dreaded sophomore slump completely with her second studio album hopeless fountain kingdom. hopeless fountain kingdom at times feels so much larger than just an album. Leading up to the release Halsey not only announced the album artwork with a scavenger hunt, but also even had newspapers created and delivered to fans with the track list. Altogether, at times it feels like a full on art project as opposed to just an album. 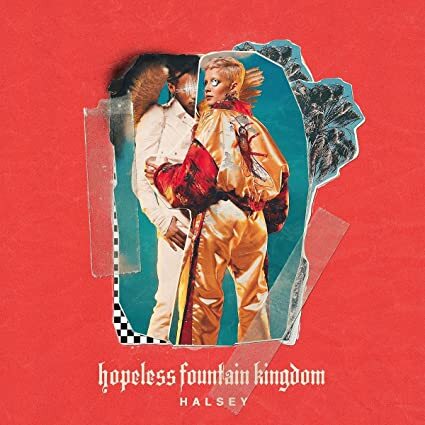 Kicking off with a recitation of the prologue to Romeo and Juliet, hopeless fountain kingdom doesn’t exactly tell a new story, but does set it in a new medium. The album tells the tale of two lovers trying to make it in a futuristic, post-apocalyptic world, and while the topic itself may not be a revolutionary one it does make for a great pop record that will most likely find itself getting major play amongst fans and on the radio. Tracks like “Sorry” and “Hopeless” standout on this second effort by the singer. The former showcases Halsey with just a piano as she laments about her inability to accept love and give love. It’s the most stripped down you’ll find Halsey in either of her albums and the vulnerability of the moment is haunting. The latter of the two is an atmospheric closer to the journey, ending it off on a note that reminds us strongly of Imogen Heap. It drops listeners off in the best way possible, with both a ring of finality as the story ends but also a touch of hope for what is to come. Admittedly, as soon as the song finishes its fadeout, we find it quite hard to resist giving the whole thing a listen again. The deluxe edition-- which is the one we’re rocking-- comes with three additional tracks that add to the world hopeless fountain kingdom creates and we would suggest investing in the deluxe to get the full experience. Even at its worst-- “Don’t Play,” which isn’t bad just not as good as the rest-- every song has a reason for being on the record and brings something to the storyline. While the idea of a Romeo and Juliet pairing isn’t new by any means, you do have to give it to Halsey that she can create a solid world with tracks that can easily stand alone on their own as well. If there’s anything that should be taken from the singer’s release, it’s that she’s a new kind of popstar who isn’t just creating music, but all encompassing artworks.